As a former proof collector I'd be very interested in seeing CP ARCs/proofs - never knew they existed! I am looking forward to see if you post pics of Don Brautigam book if you have it. I have only seen the listing from the newsletter and one review of it from a google search and nothing else. I can take photographs of that one if the OP does not own a copy. The only two I am actually missing (deluxe variants notwithstanding) are Chimera and Chimera II. :/ Both have eluded me for years. I don't know if anyone noticed it: in the last newsletter Jerad mentioned he found 6 pages signed by Don Brautigan and Dean Koontz and he'll put up a deluxe edition of the porfolio that'd be around 1.5K. The first set of 3 books in Moorcock's Elric series is available at Centipede Press today. Signed copies of Elric sold out! Unsigned sets are still available. While I appreciate the quality of Jerad’s productions, I don’t collect Centipede in particular (aside from ‘SALEM’S). However this thread is making me rethink that position. Thanks for all the research and thought you are putting into this thread. It is fascinating, informative, and entertaining. I look forward to reading more. All I have are his HELL HOUSE, ENDER'S GAME and one of the SALEM'S editions (I don't even know which one as only the Hell House is not in shrinkwrap), with CHILDHOOD'S END coming soon to a bookshelf very near me. They are all beautifully done books I am proud to own. Moorcock is such a terrible writer. Salem's Lot Prints and Traycase! That was a pretty quick sellout! But these books have been in the pipeline for quite some time, have excellent design, and some top-notch contributors, so I'm not totally surprised. Next up is the first Studies in Horror Film book, though that title wasn't in use yet. 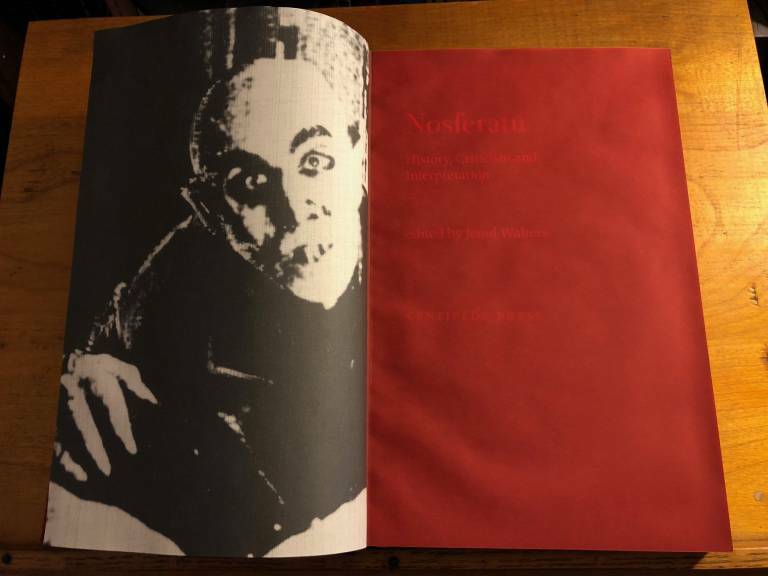 Instead, it is called Nosferatu: History, Criticism, and Interpretation. Looking forward to your post(s)! This is a fantastic thread Lotuz! Is there any way of keeping track of unsigned deluxe editions? I haven't been a long-time CP collector, however I know there are usually overruns of the deluxe editions which are sold for less than the signed ones. As far as I know the only place to get hold of these copies is the newsletter/emailing Jared but that does not tell you how many copies were made available for sale (although I imagine these will be very few in number). Yes, as much as we all love Centipede- their "Complete" bibliography will be a nightmare to compile- for the above reasons among others (i.e. published price fluctuations, changing cover art, etc. ), which is why the work you are doing here, Lotuz, is important, and will- no doubt- prove invaluable to current and future researchers. 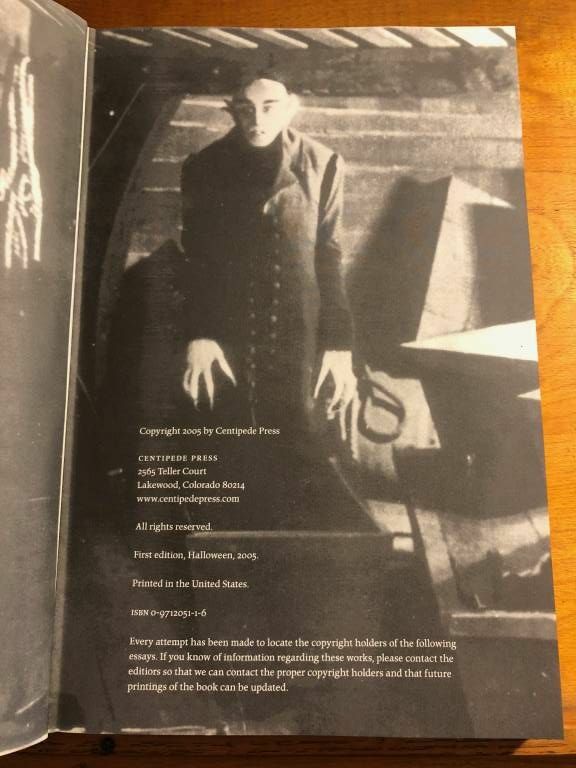 Are you sure that there are overruns of the deluxe editions (which are mostly limited to Millipede Press titles, the Gothic series, and the giant art books)? I know that there have been regular overruns of the regular S/L titles for a number of years - pretty much every title published since 2013 has had a small number (generally impossible to verify exactly) of unsigned overruns, but I have not heard of a deluxe title with overruns. When there is an unsigned overrun title that I can verify I will include it as a published "state", though mostly without specific print runs, since they are largely unknown. I don't think it's even possible to publish a 100% complete bibliography. But I'm hoping I can get maybe 90% there - and a little more if people chip in if they have a state or information for a book that I don't put in a post! This is a placeholder post - there is an update to the Chimera I post that I need to make. 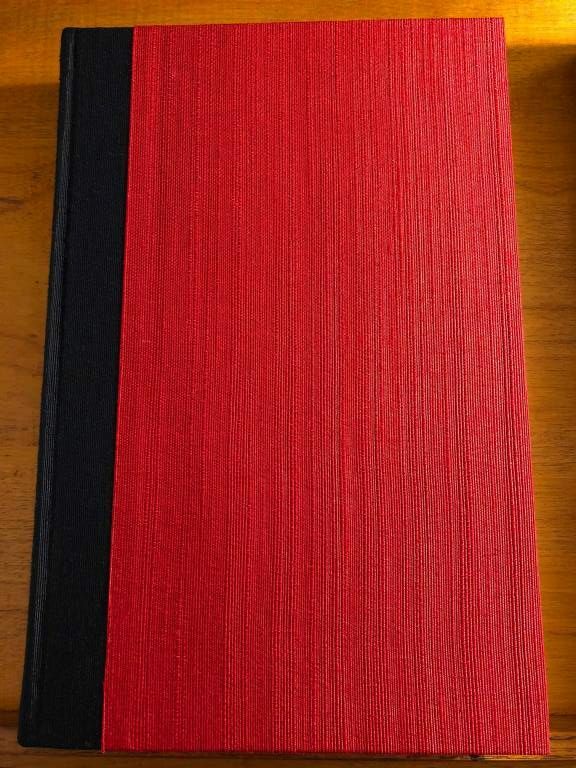 It is the first book to experiment with an alternative printing technique that is really very clever. Some of the text was altered to be less legible and more scribbly/wavy. I'm not sure how it was done but it was part of the printing process and not a font change because the letters are inconsistent throughout those chapters and don't conform to a type block. The technique was used to its full potential in Jeckyll & Hyde, for which I will include pictures. I don't have pictures of the Chimera I pages but I will try to take them and update the original post. 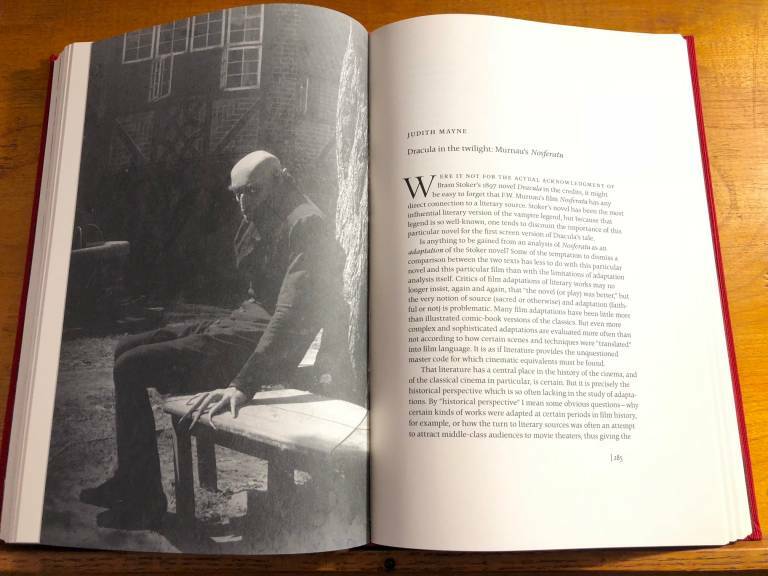 Nosferatu: History, Criticism, and Interpretation is coming in the next hour. Ok so I am talking about the recent Deluxe editions, for eg. the one made for Swords and Deviltry for instance. Perhaps that was a one-off, but I have a copy of one of the overruns, an unsigned edition of the oversized, slipcased copy. Are Deluxe editions different than "oversize" editions? 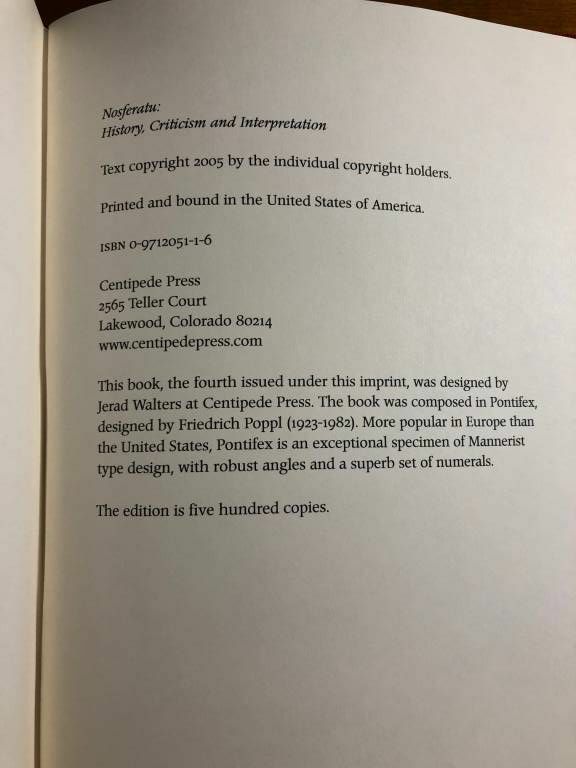 Half the World Lettered "LL"
This is the fifth book in the bibliography, though as the limitation notes it is actually the fourth Centipede Press book, with Stigmata published under the Cocytus Press imprint (the only Cocytus Press book). This book is important because it established very early that the interests of Centipede Press are not just literary, but historical. 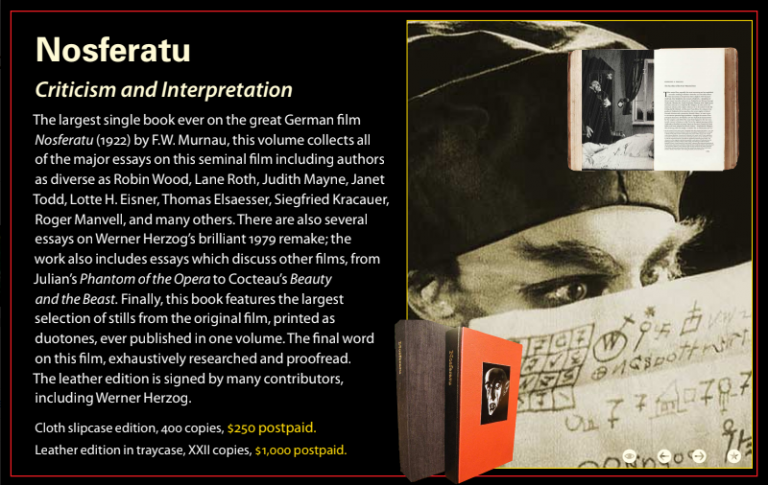 This book is about the movie Nosferatu, an unauthorized adaptiation of Dracula and the first(?) “German expressionist horror film”, released in 1922, directed by F. W. Murnau and starring Max Shreck. It’s a defining film in the horror film canon, and much has been written about it. 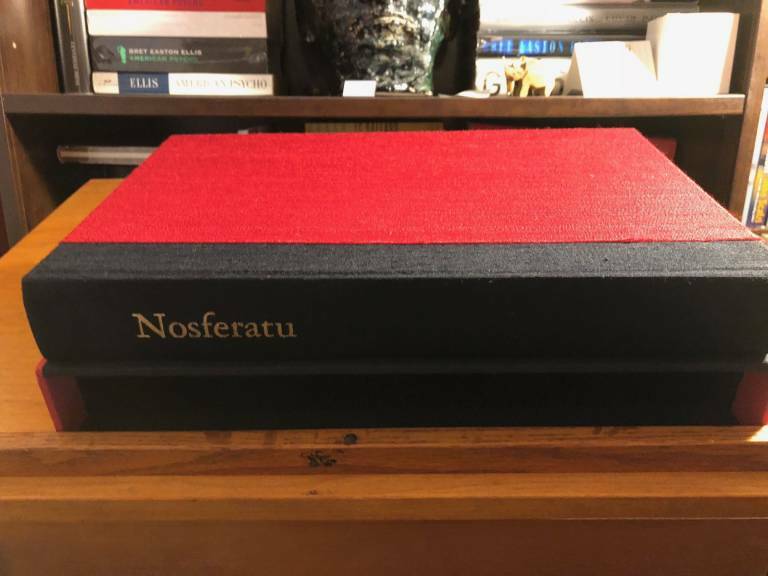 This book is the predecessor of the “Studies In Horror Film” books, which have been continuously, if intermittently, released since (the latest was The Howling, around Halloween of this year). 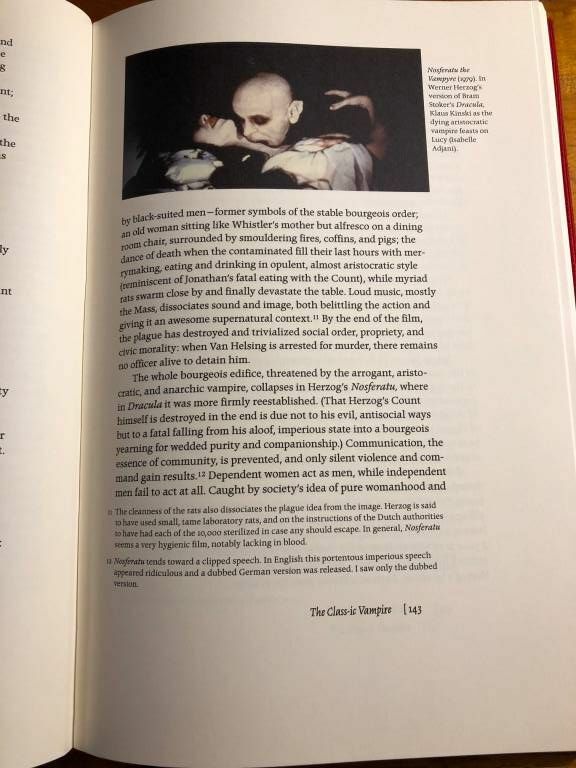 These books engage with horror films from the past 100 years in a very serious way, collecting critical essays about the films along with reminiscences from actors (when possible), and lots of commentary from people involved with, adjacent to, or seriously interested in the film at hand. These books are solidly academic! They are well sourced, highly informational, and are serious reflections on some of the key films of the horror genre. This book sets a high bar for the series, both in terms of its production quality and content. This book, and all of the following books in this series, does a great job of pulling from the available stills of the films to present some striking images! 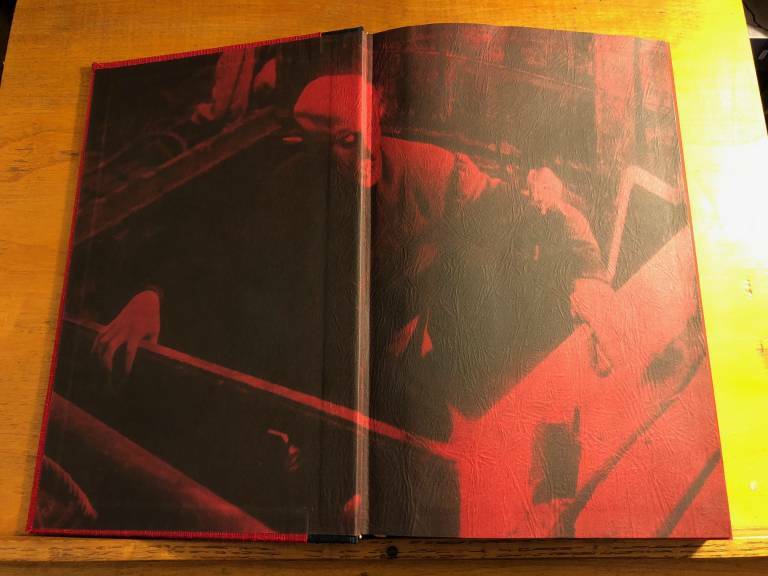 From the description: "This book features the largest selection of stills from the original film, printed as duotones, ever published in one volume." The non-deluxe version of this book isn't signed or numbered. The printed limitation is 500, though this book is scarcer than that would suggest. The newsletter says it's 400 copies, and the webpage for it listed 300 copies. Because the individual copies aren't numbered, it's hard to tell. “The book was composed in Pontifex, designed by Friedrich Poppl (1923-1982). More popular in Europe than the United States, Pontifex is an exceptional specimen of Mannerist type design, with robust angles and a superb set of numerals." I have never seen one of these for sale, or even any pictures of the actual book. Thanks, everyone, for your patience! Up next is the very first title in the Gothic series, another neat idea for a group of books, which were published between 2006 and 2013. The Gothic series also all have deluxe editions, which are uniformly amazing and some of the best deluxe books out there. There are both "oversize" and "deluxe" books. Sometimes they overlap (the Gothic deluxe series is also oversize), and sometimes they don't (the Millipede Press deluxes are not oversize and the Fafhrd series is oversize but not deluxe). The deluxe books have different materials - usually leather and heavier paper - and also generally come with a traycase and extras. The oversize Fafhrd books are gorgeous though - the double-stamped slipcases and the large art are wonderful! 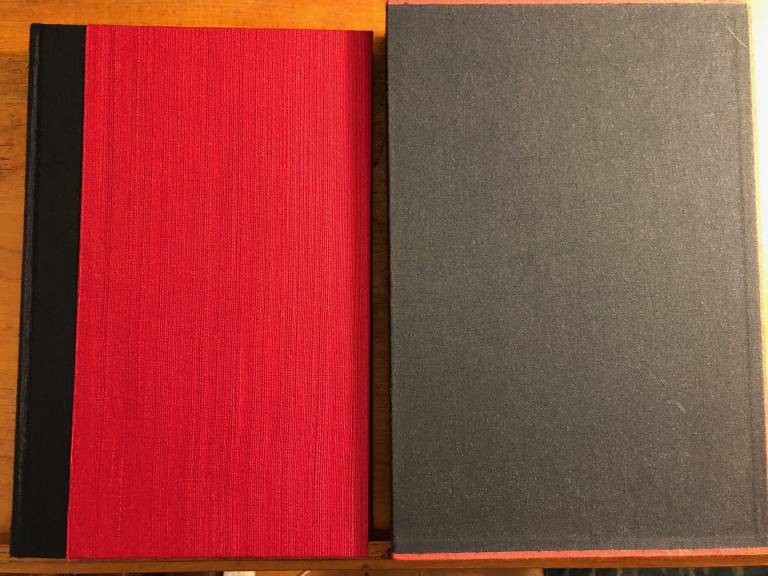 My Nosferatu is in the same cloth slipcase as yours with same red boards and numbered XIII with Herzog signature. Any thoughts on this? Interesting! Here's my guess: for some of the earlier books, there wasn't enough interest in the deluxe version at the price point he offered, and so rather than make the deluxe editions, the limitation pages were repurposed and inserted into the standard editions. This happened with the Don Brautigam book, for example. There was supposed to be a deluxe edition signed by Dean Koontz and marked with roman numerals, but it never materialized, so instead there are ~20 copies of the standard edition that have the limitation page meant for the deluxe. The question still out there, is: were there any deluxe editions made, or were all the limitation sheets repurposed. My guess, based on your copy, is that there are not actually any deluxe editions of this title or Don Brautigam, but that all the sheets were repurposed. Every once in awhile I bug Jerad with questions like that and sometimes he remembers and sometimes not. I'll add this to my list of things to try to hunt down, and I'll change the original post to reflect your state. Fortunately, CP books are packaged very well – I have only had one book arrive damaged, and that was because the outside packaging was pierced with a long skinny rod of some sort (fortunately only the slipcase was damaged). So I came across this over at Cemetery Dance forums, it is a personal collection with a few fantastic Deluxe editions of CP. I am sure lotuz will get to these and do them justice with a nice juicy post but enjoy the pictures in the meantime!